Amazing views from the ridgeline! love the idea. However, reality is a *****. The conservancy has their own idea of what trails should be there - you might want to take a look: http://www.scottsdaleaz.gov/preserve/trailsplan. In order to do this, you'd have to get your plan approved by them. Having worked on getting new trails built in a local park before, I can tell you this is a long and frustrating process. These folks are usually slow to accept new ideas and there are always those who are against it. Then there is the whole funding aspect. What you propose is some pretty serious trailbuilding. Pretty sure parts of it would require more than weekend volunteer work. Who would pay for that? But, man, I do love the idea. While we are wishing - I'd also like to see an alternate way down from the top of sunrise that hooks up to Sonoran without going through that neighborhood. It would certainly have less foot traffic and I'm sure the locals would appreciate less dirtbags riding down their street. More trails in the McDowells would be cool....as long as the guy that laid out TT and the Sonoran trail isn't doing it! Last edited by Raybum; 03-09-2011 at 08:11 AM. no kidding. Those were definitely not designed for bikes. That's excellent. My favorite part is "APPROVED WITHOUT THE AMENDMENT TO ALLOW HORSES". Hopefully they'll build this trail a little more sustainably than the East End trail. And hopefully they'll build it within my lifetime. Really, why? Challenging yes, but trails should be. Love it. Make it so. True, but I guess it depends on what kind of challenge you like. I personally enjoy a trail that is rideable, maybe not by 100% of the riders, but at least an attainable goal. I would venture that most humans don't clean the Sonoran trail from south to north due to the steep, sharp, and loose uphill switchbacks it has. If no one can practically do it, then I think it's safe to say it wasn't designed for bikes. its a neat idea, that will probably never happen. To be honest I'd be much more interested in seeing some new style of trails in the McDs - more techy or with jumps etc. The McDs are a lot of fun but mostly all the same - steep, rocky XC..
i have heard mostly nothing about any "unofficial" techy, dj, FR stuff in the area. If you know of anything, please PM me. I've been thinking about this trail since I moved from MN last June. I've moving back to North Dakota in 4 months....so I thought I better at least put a little graphic together to float the idea. It's one of those dreamy, big picture, warm and fuzzy "what-if" kinda things. I'm not sure what it would take to do this....as a long time IMBA member, trail builder and avid trail rider (along with my professional experiences presenting/planning ideas to City/County Councils) I know it would take some serious time. Approval by 2015, construction by 2020? -the side slopes (off camber) around the radio towers is FOR REAL. -If constructed, this trail would be VERY popular. 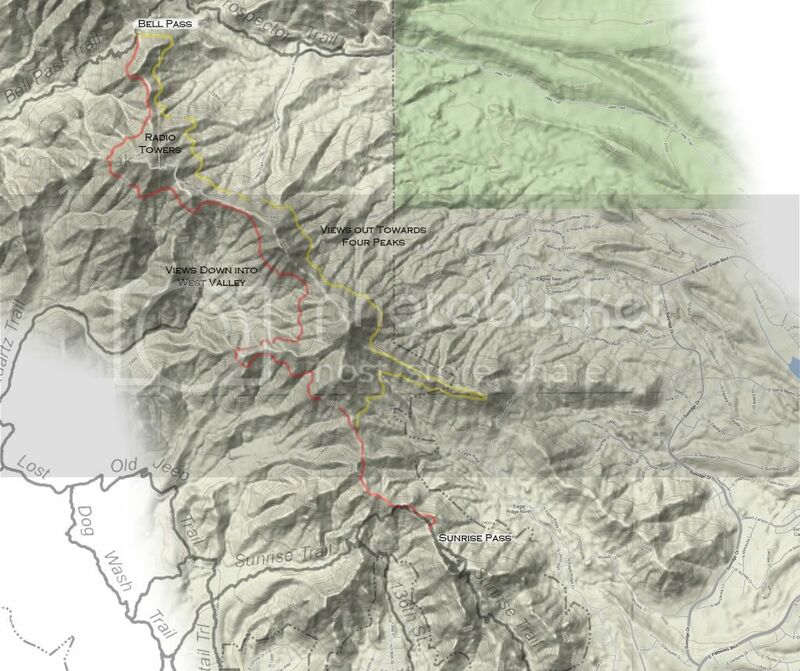 -Hiking this (as a loop) would take all day, not? I really, really like the section of trail at the top of Bell. As you head west you just float up there on that ridge and it's awesome.....but it last about two minutes. This (proposed) trail would basically be a 10-mile loop of this riding experience. 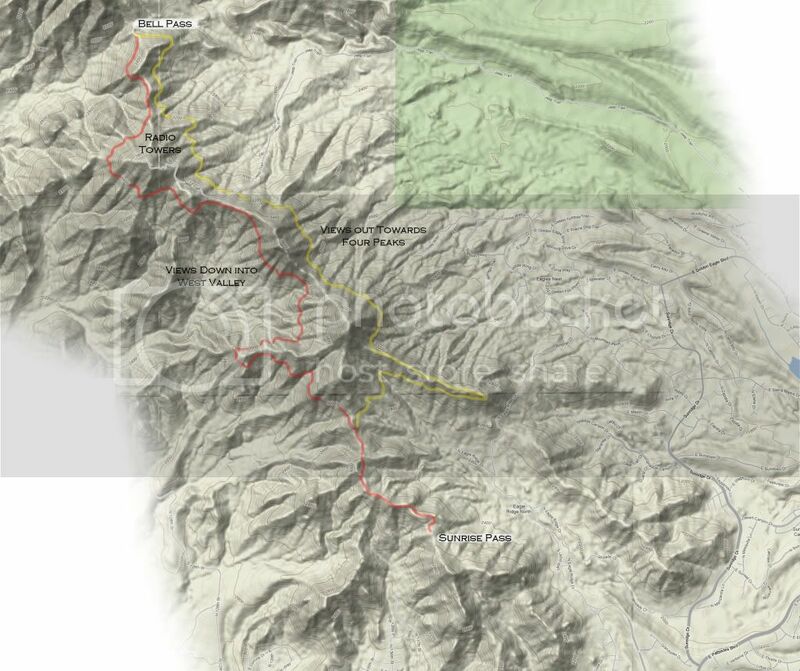 i merged the pdf trail map with the proposed trail route for a bit more context. That would be one awesome trail. I don't see why it shouldn't undulate some more though, views like that should take some work and sweat to get to. Who's on the advisory board representing mountain biking? I like the concept and would love to see this kind of 'high traverse' between these two points.